In the sweltering heat of July, the Oodi worksite prepared for testing the lungs of the building, i.e. the start of the measurements and adjustments of the ventilation system. The objective is to achieve fresh and healthy indoor air without any disruptive noise or draughts. The challenges of this demanding phase, starting in early August, are related to the diverse premises of the building with their different sound technical requirements and special valve solutions. “This building has hundreds of terminals for supplied air, meaning valves and grids mostly in the ceiling and the walls, but also integrated in exceptional spots, such as the walls above stairs and, later on, book shelves and tables. In the 15 years of my career, I have never seen these kinds of ventilation solutions before,” says Tony Lindholm, Are project manager as he presents the low-speed displacement unit hidden in the staircase structure of the third floor loft. “The allowable decibel values of the input air flow, i.e. the airflow’s noise pressure level, varies is different spaces. Whereas 45 decibels are allowed in workshops and 38 decibels in the kitchens, the maximum allowed value in the office and meeting premises is only 33 decibels and in the movie theatre, music studios and the control rooms it is as low as 25 decibels,” Tony Lindholm says. The decibel measurements will take place at night, between 4 am and 6 am, as the train, tram and bus traffic are at their quietest at the time. Any noise carrying from outside the building should not disrupt the noise measurements of the technology used. The large terminal shown in the picture is located on the wall of the south loft on the third floor. The protective plastic cover will be removed before the ventilation machines are switched on, and when everything is working well, the valve will be covered with a decorative grid. Input air will flow to the ceiling and be distributed along the walls until it is sucked out through the structures below the suspended ceiling. 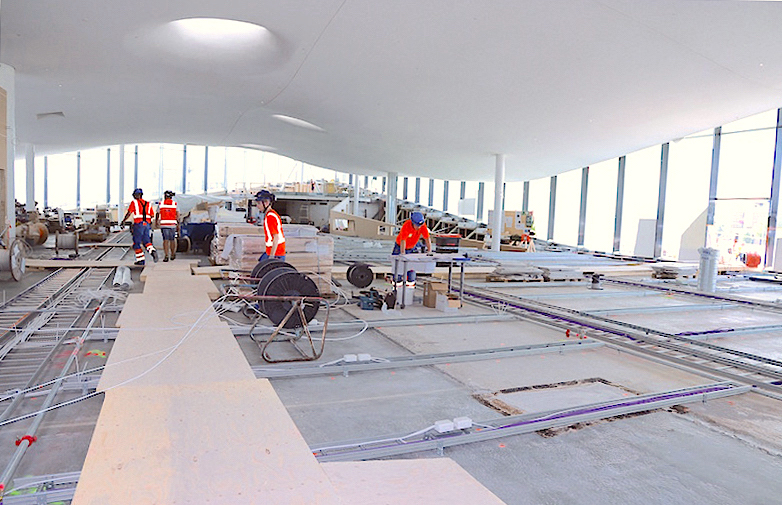 The construction work on the third floor is going well: the suspended ceiling has been completed and its surface has been sprayed so that it now resembles a stone ceiling. 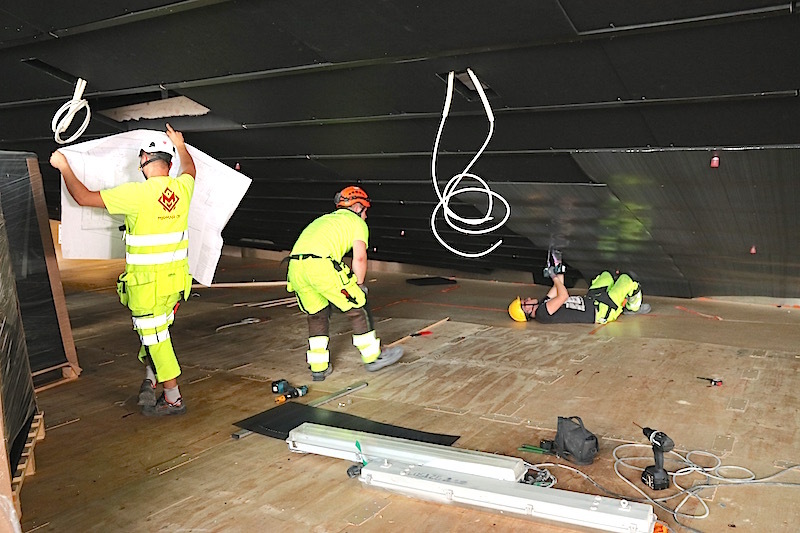 Even though electricity works are still continuing in the southern part of the floor, the cables at the northern end have been covered with the installation floor, of which a few hundred square meters have been covered with oak parquet. Cleaning and ventilation go hand in hand. The highest possible cleaning class, P1, has been determined for the construction work at Oodi, which means that there must be no construction dust in the ventilation system. This requirement must be fulfilled before the protective covers of the ventilation terminals can be removed. Putsblank Siivouspalvelu Oy is in charge of the continued maintenance cleaning and the final cleaning of the finished premises that are about to be sealed. “A group of ten people takes care of cleaning, vacuuming, wiping and washing surfaces with microscopic care. 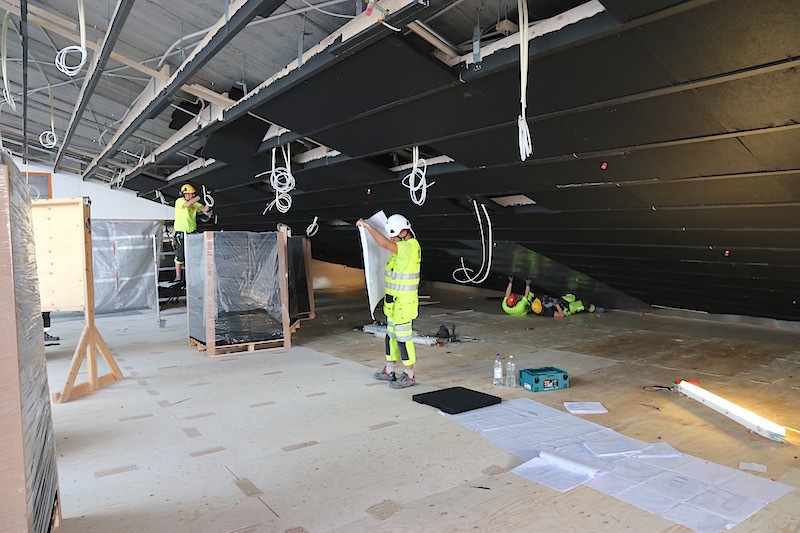 A challenging stage for our work was the multi-stage suspended ceiling work of the third floor with its spraying work, as it spread microscopic white granules into the air,” says the team manager Kirsi Haapalainen. The structures to be sealed will be scrutinised with extreme care. 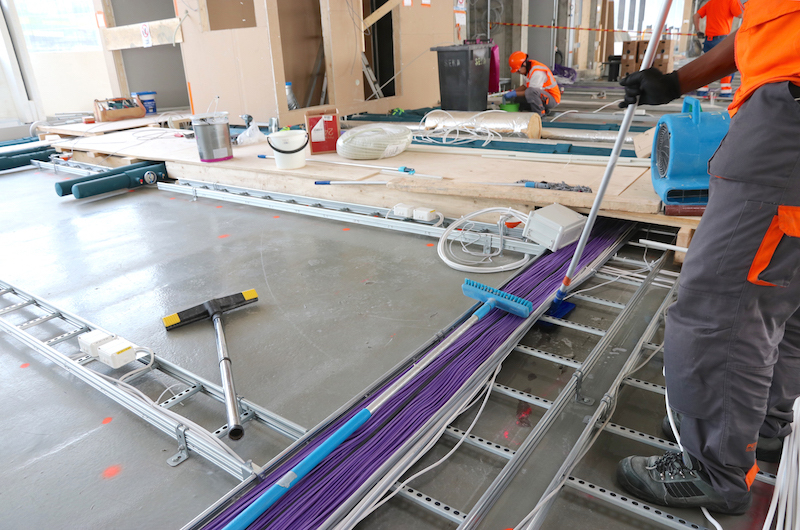 For example, an installation floor can only be installed on the cabling after the floor has been brushed, vacuumed and wiped with a damp mop, also from below the installation shelves and in the tiniest cracks. The measurements and adjustments of the ventilation system cannot be started until all room premises are technically complete and fully clean. 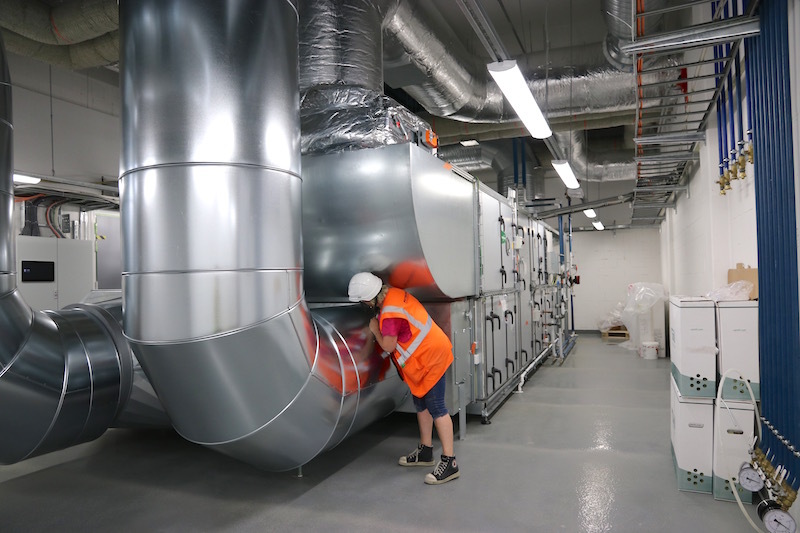 Every bend and twist of all pipes and even the internal surfaces of device cabinets will be cleaned in the ventilation system’s control room in the basement. 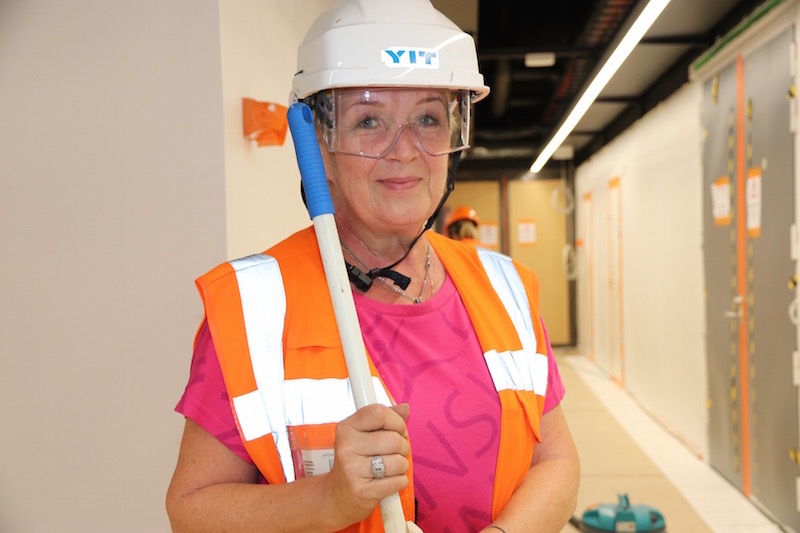 Kirsi Haapalainen inspects the finished work, but the final say as to whether a sufficient level of cleanliness has been achieved lies with an external cleaning consultant. 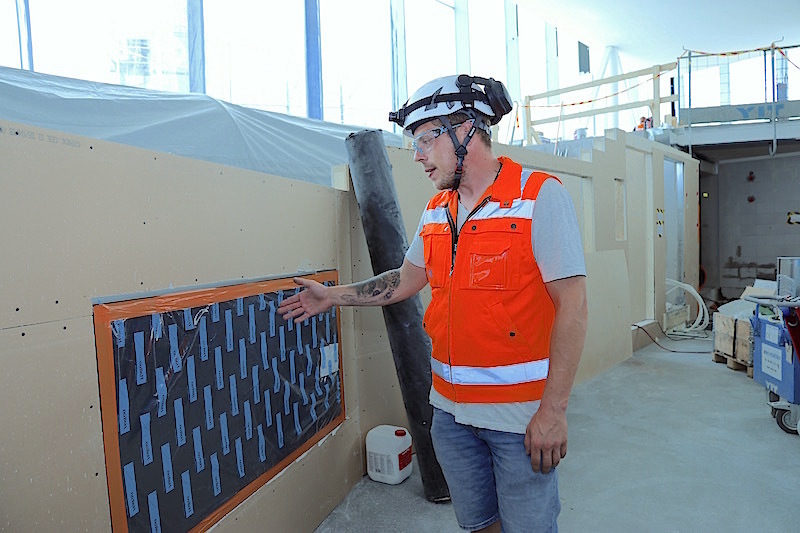 A P1 cleaning class inspector from H&H Puhtaudenhallinta visits the worksite every week, with gel tape as their tool. The worksite will receive a report on any possible particles that stick to the surface of the tape. The movie theatre, Kino Regina, was a particularly challenging area for ventilation. The noise of the system should not disturb the audience’s enjoyment of the movie, but they do need enough fresh air. Tony Lindholm has given the movie theatre a playful nickname of the ‘monster of sound absorption’. The frames of the seats are currently being installed in the movie theatre. The space below the stand will be used as a snack room that will be part of the family library, and will house tables and chairs. Wool insulation was installed under the stands in late July. Mirmar Oy is a wool insulation installation company that is in charge of the suspended ceiling installation in the public premises on the entire first floor. 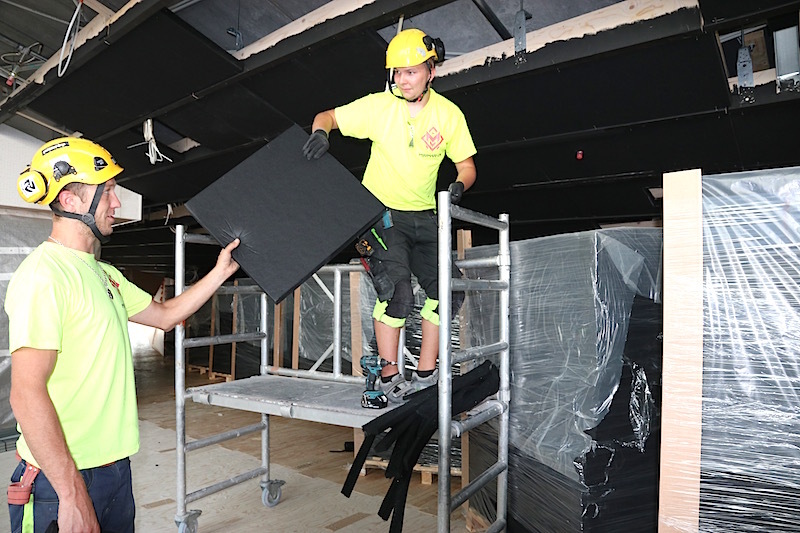 In the photo, Ragnar Kivik is handing a five centimetre thick insulation sheet to Eerik Raudhäiding. Perforated sheet metal will be installed on the plates, followed by panel layering. Working positions can sometimes be challenging! As this is a family library, hundreds of babies and toddlers will crawl in this same space, exploring the area after finishing their snack time. The front of Oodi and Kansalaistori will go through a transformation during the summer. 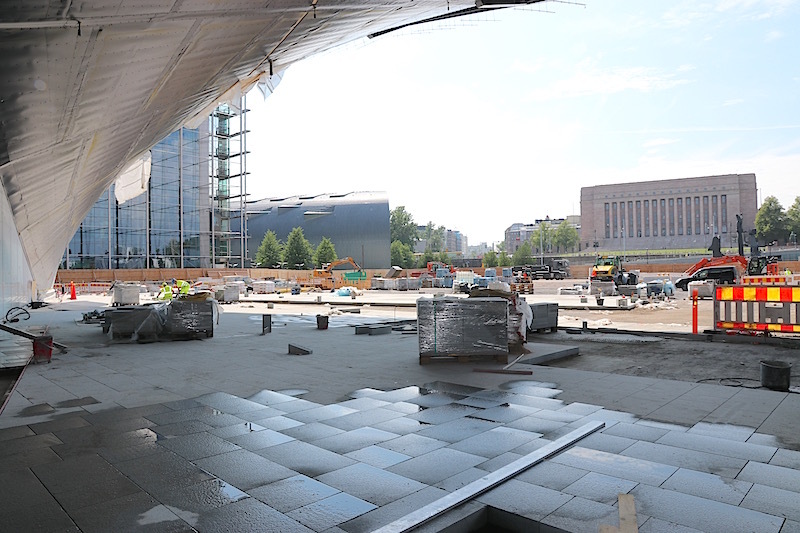 Installation of the granite stone tiling is underway, and Destia is building the Loru playground and Makasiinipuisto park. Along these stone tiles, future crowds of customers will walk into this library of a new era.